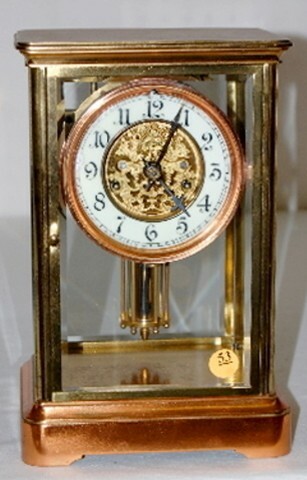 Waterbury "Ostend" Crystal Regulator Clock nickel and brass pendulum; porcelain dial with visible movement and filigree center; brass movement marked Waterbury; rich gold plated with copper plated base. (Small areas of damage to dial at 9 and 12; case finish worn. Runs and gongs. 10"